How far would you travel to see a rare bird? 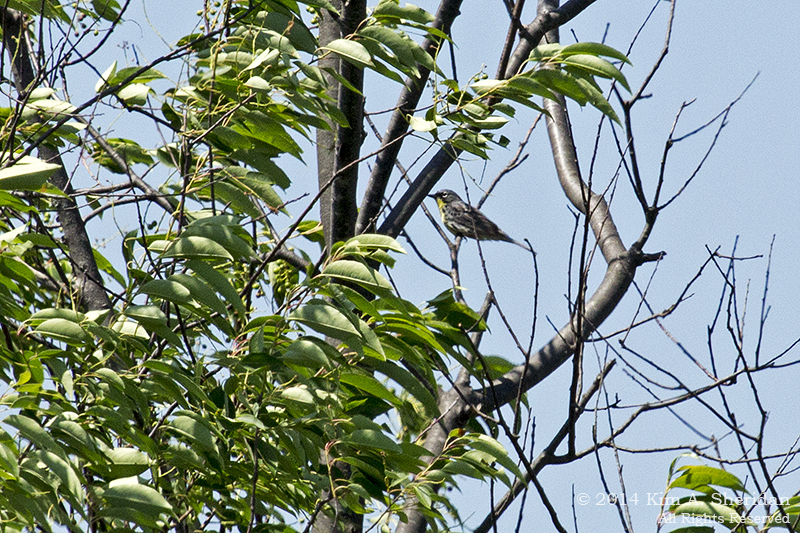 I flew 800 miles and then drove 150 more to see this one: a Kirtland’s Warbler (Life Bird #188). Okay, full disclosure; I was going to Michigan anyway. I did plan my trip for late June and then drive across the state for a glimpse of this bird, though. I didn’t fool around trying to find this rare, flitty little warbler by myself, either. I took a tour sponsored by Michigan Audubon and led by a very knowledgeable young woman. What’s so special about this bird that people travel hundreds of miles and take tours to see it? 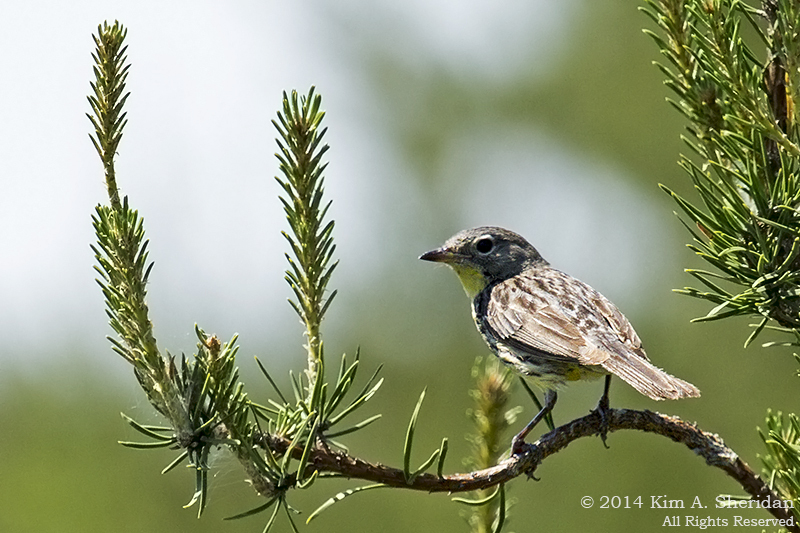 Kirtland’s Warbler is a Federal Endangered Species, and it nests only in young jack pine forests in Michigan and Wisconsin. It was listed as an Endangered Species in 1967. 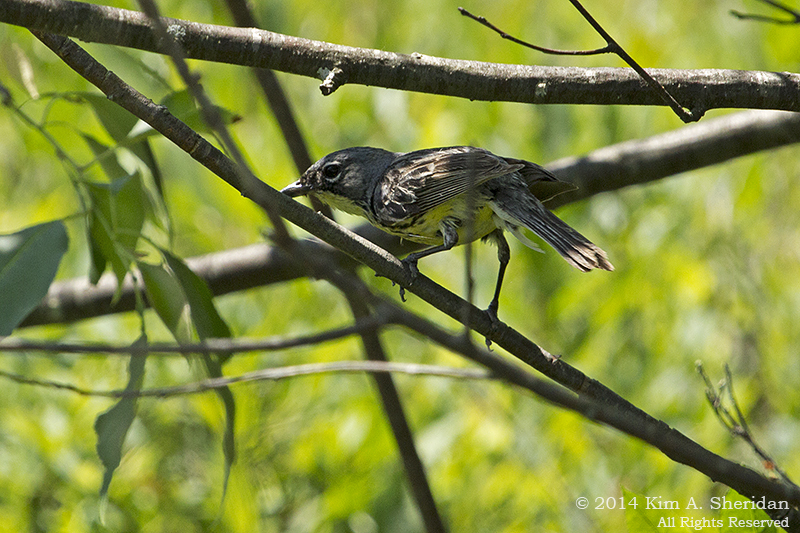 In 1973 the Kirtland’s Warbler Recovery Team was created, with representatives from the U.S. Fish and Wildlife Service, U.S. Forest Service, Michigan Department of Natural Resources, Michigan Audubon and other organizations. The following year 167 singing male warblers were recorded, a record low number. 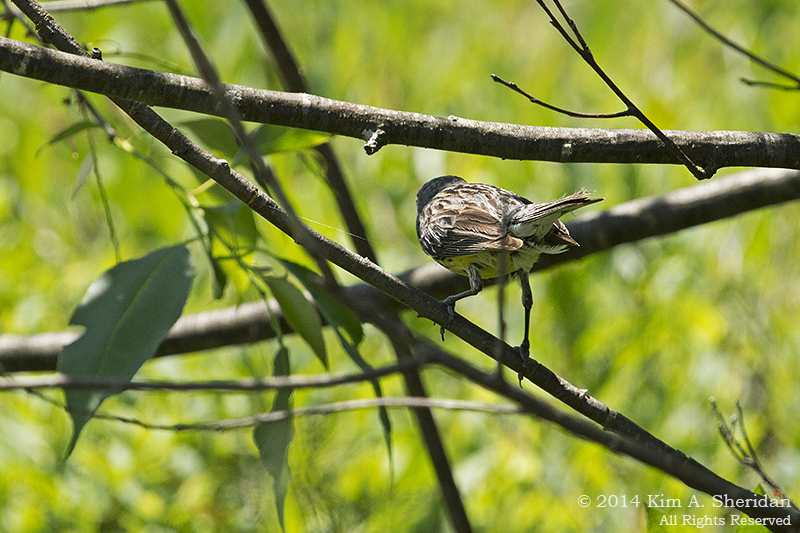 Conservation measures enacted by the Kirtland’s Warbler Recovery Team are working. In 2011, 1,828 singing males were recorded, well beyond the plan goal of 1,000. In fact, the number of warblers has exceeded the recovery goal for over a decade. 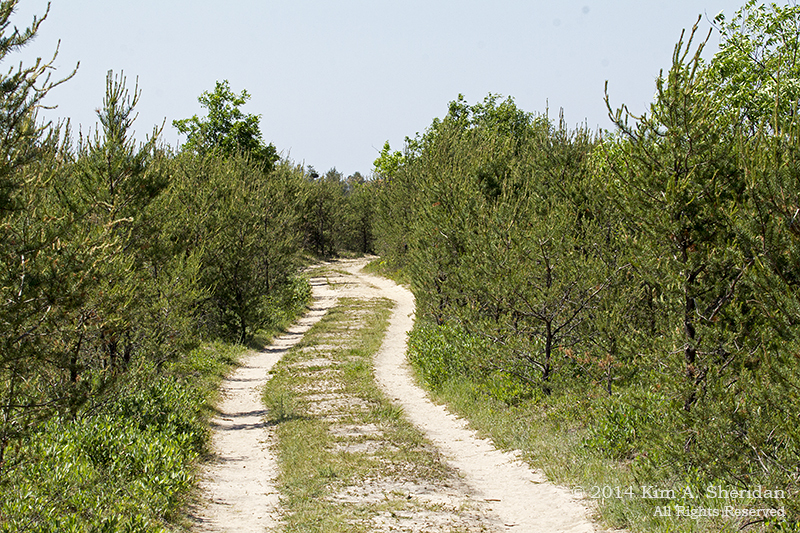 Two-track road through a jack pine plantation in Grayling State Forest, an area actively managed for Kirtland’s Warbler. 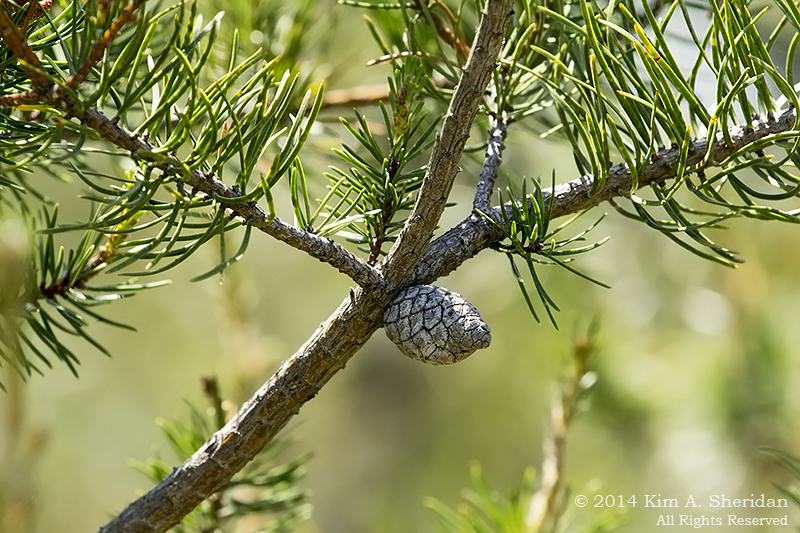 Pine cone of a jack pine tree. See how it’s closed up, with its seeds still inside? This is a serotinous cone. It only opens and drops its seeds under the high temperatures of a wildfire. Jack pines have adapted to take advantage of frequent fires. 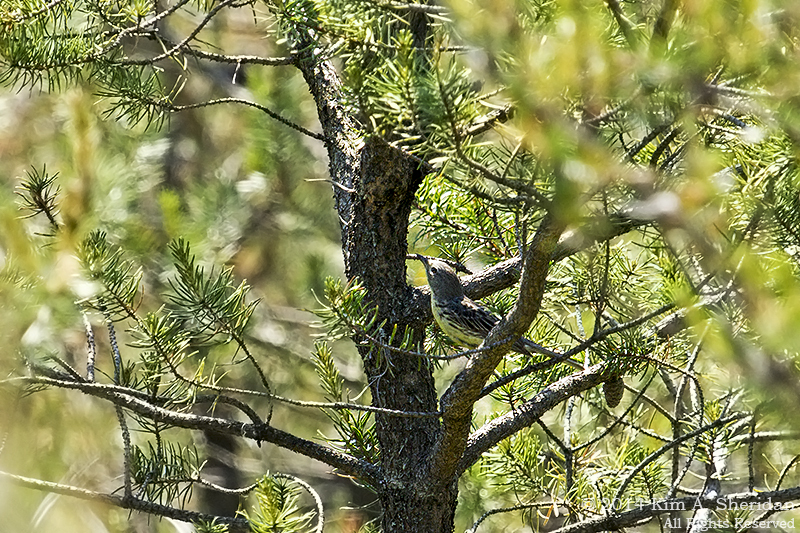 Kirtland’s Warblers have adapted to take advantage of jack pines. Young pines, that is. They nest on the ground under cover of the drooping lower branches. One pair needs at least 8 acres, and maybe as much as 30, of small pines. Once those trees reach twenty feet, the birds no longer nest there. Historically, frequent wildfires maintained this young jack pine habitat. Since this is the only tree the warblers nest in, they are dependent not only on jack pines, but frequent fire. Except that fire is a tricky thing to manage. In 1980 a controlled burn got out of control and led to a wildfire that burned 25,000 acres and killed a USFS biologist. So now the Recovery Team relies on that nemesis of many environmentalists, clear-cutting. 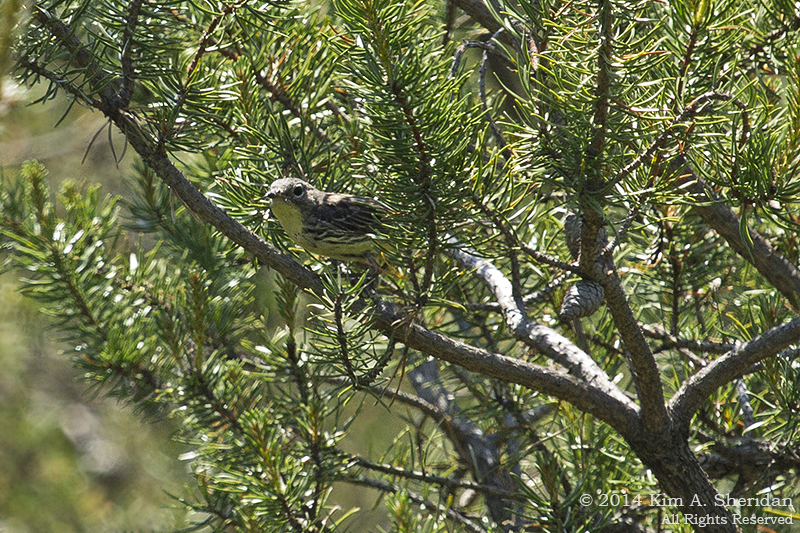 Areas of about 4,000 acres each year are logged and replanted with jack pine seedlings on a rotating basis, ensuring that there is always suitable habitat for the Kirtland’s Warbler. Also, Brown-headed Cowbirds frequently lay their eggs in Kirtland’s Warbler nests, leading the warblers to raise cowbirds rather than their own young. So cowbird control is a critical part of the plan. Even though the Kirtland’s Warbler has exceeded its recovery goal, the need to suppress natural wildfires to protect life and property means that continued management with human intervention will be needed. But it’s not just this little half-ounce warbler that benefits. Young jack pine habitat is beneficial for wild turkeys, badgers, white-tailed deer, snowshoe hares, numerous birds and at least two threatened plant species. That’s better, but now there’s a stick in the way. Move a little to the left, please? These fashion models, they’re just so flighty. Here’s a bird I did not plan for. This is a Piping Plover (Life Bird #189). I found him in Buttersville Park, just south of the Ludington South Breakwater. 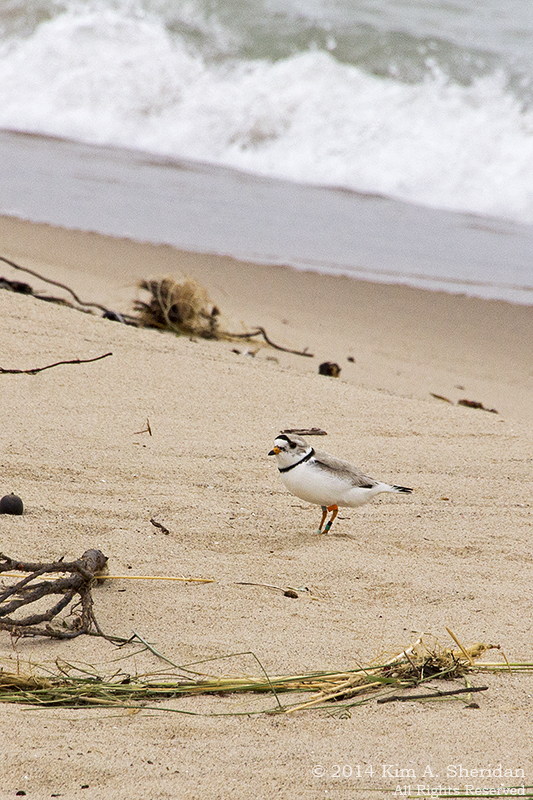 On the Atlantic Coast Piping Plovers have Threatened status, but in the Great Lakes region they are officially Endangered. These little guys like to nest right on the beach and dunes, in cobblestones or sparse vegetation. 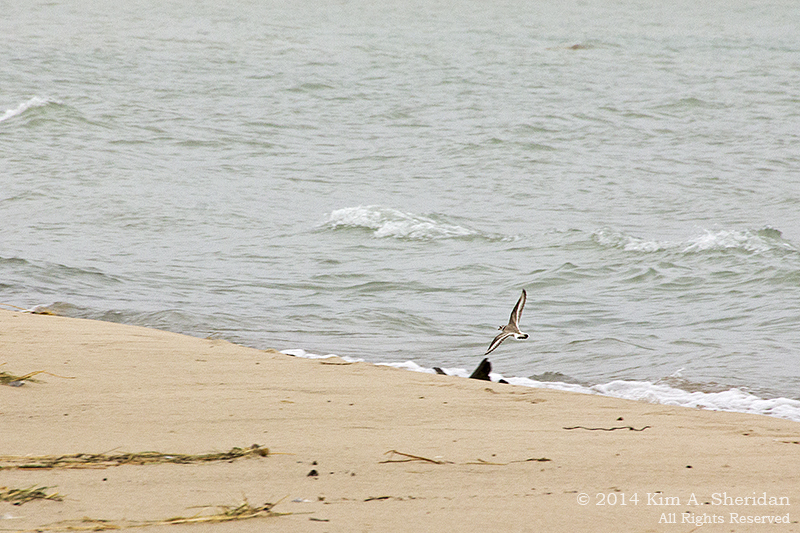 Humans and pets using the beach disturb the birds, sometimes leading to nest abandonment. In addition, people and vehicles may accidentally crush eggs or tiny young chicks. Add in predation by wild animals and habitat loss due to beach development and it’s no wonder this tiny bird is in trouble. People are helping the Piping Plover, though. Nesting habitat is identified and monitored, with human access restricted where necessary. Active nests are fenced to keep people and predators out. Wait! Don’t fly away mad! 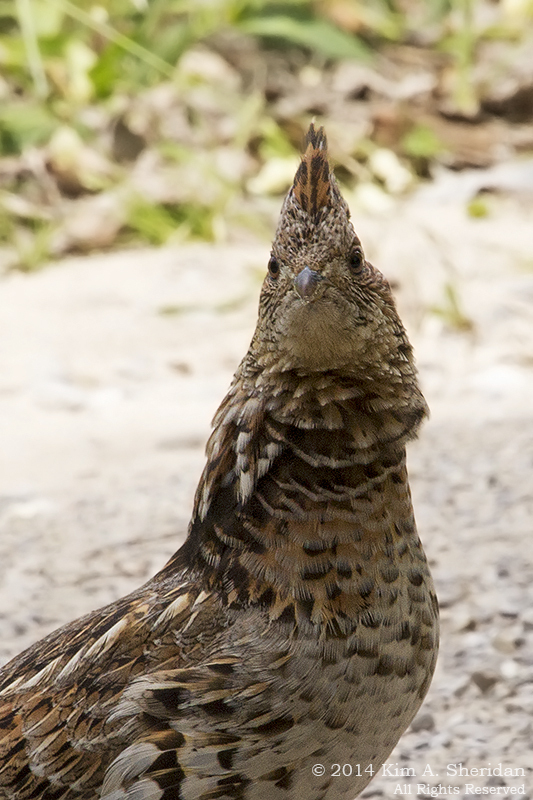 Another completely unexpected bird, this Ruffed Grouse (Life Bird #190) is anything but rare. In fact, they are widespread all across the U.S. They are really elusive and hard to see, though – in some areas. My friend Don, convinced he’ll never see a Ruffed Grouse, has made it his life’s goal to hear one drumming in its spring courtship ritual. Imagine his surprise when I e-mailed this photo taken at Sleeping Bear Dunes National Lakeshore. 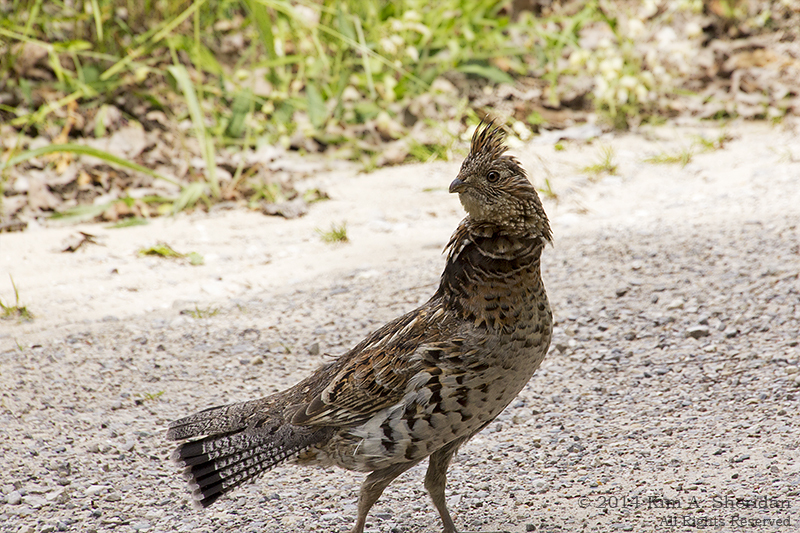 For that matter, imagine my surprise when I turned down a dirt road and came upon this bird strutting around. It paraded slowly down the road for quite some time while I took photos right from the front seat of my car. It didn’t seem at all concerned by my presence. 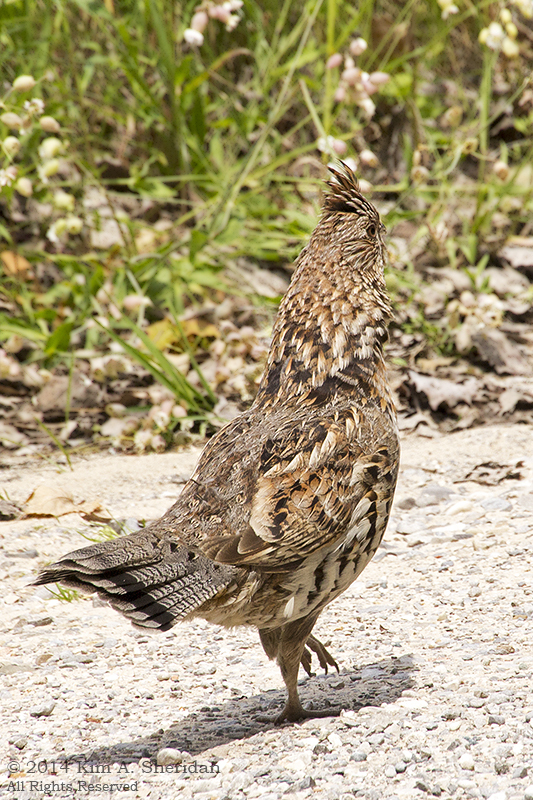 It appears that, unlike shy Eastern grouse, Midwestern birds are much bolder. I’m ready for my close-up now.